In a typical Ponzi scheme, early investors earn “profits” not through any legitimate investment activity on the part of the Ponzi scheme operator; instead the operator simply transfers money that later investors deposit to the earlier investors who seek redemptions. As such, when the scheme goes bust, as it must, the Ponzi scheme operator will not have enough money to cover all of the investors’ deposits, let alone the earnings on those deposits that the investors thought they were owed. Should the scheme’s winners – i.e., those who withdrew more money than they deposited – be compelled to return their fictitious profits to help defray the losses to the scheme’s losers? Should they be required to do so even if they did not know, and had no reason to know, that theirs was not a legitimate investment? Caselaw permits clawbacks from innocent winners in a Ponzi scheme, and there has been a dramatic rise in the number of such cases over the last decade. But, as courts have noted, the clawback suits rest upon two bodies of law – securities and bankruptcy -- that are on a “collision course.” The two were never intended to interact and their interaction has produced confusion, unpredictability and unfairness. More troubling still, there has been no sustained inquiry into the foundational normative question – viz. whether innocent winning investors should be made to help defray the losses of the losing investors in the first place. This Article addresses that question, and it argues that clawback suits targeting blameless winners lack a compelling legal and equitable basis. More specifically, the Article examines the relevant statutory framework as well as other restitutionary doctrines, and it finds that none of these can adequately justify attempts to have those who innocently profit from a fraud help restitute the fraud’s victims. 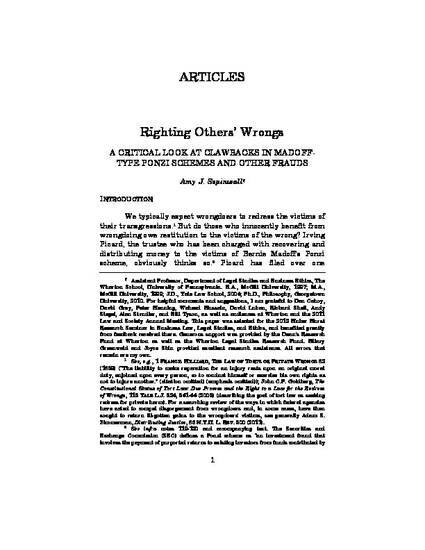 Nor, the Article argues, can the clawback suits be justified by appeal to basic concepts of fairness: It is true that mere luck differentiates the innocent winners of a fraud from its equally innocent losers, but it is also true that mere luck differentiates the innocent winners of a legitimate investment from the equally innocent winners of a fraud. All three sets of investors are in a morally equivalent position. It is unfair, then, to require only those who benefited innocently from a fraud to defray the losses to the fraud’s victims. Instead, the Article concludes, all of those who benefit from playing the market – whether through legitimate or fraudulent investment vehicles -- should share responsibility for restituting the losses in which financial fraud results. The Article ends by proposing a mechanism for implementing the expansive restitutionary obligations that the Article seeks to defend.